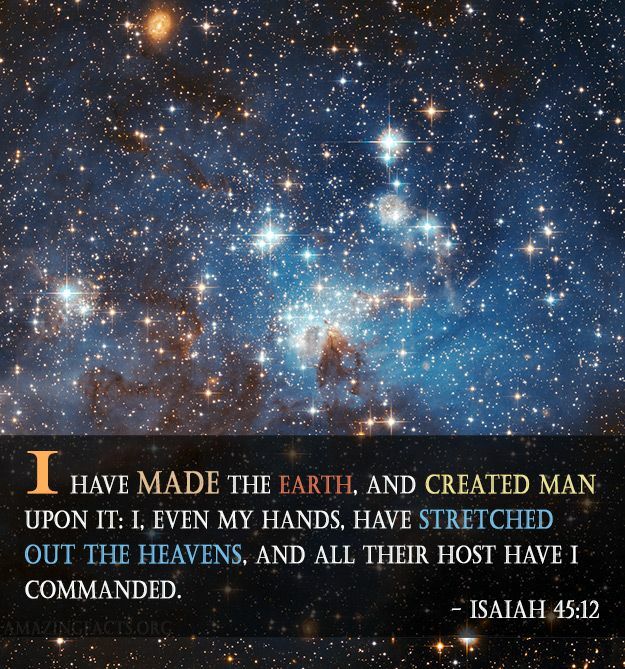 Again, God declares Himself to be the Creator of the world.His true purpose was not to create the earth in vain (in Hebrew, tohu, meaning empty) but to populate it with that which would please Him and bring Him fellowship. The wonderful thing is that, in doing so, He also created a world full of all things for us to enjoy (I Tim. 6:17). To richly enjoy. He has gifted us with so many wonderful things in this world, in our lives; and He created us by Himself and for Himself ( Col. 1:16). I’m going to give a nod to the creators of Windows 10 here. I absolutely love the pictures they offer us every day. The beauty of the earth and the universe come up on my computer screen every morning, and I generally take a moment to read about each day’s offering. I will never see most of the places they show us, but I can still stand in awe of all that God has created. You will never, ever convince me that it all just happened because of some big bang from some unidentified mass whose origin is impossible to trace. It makes no sense. God does. He is the Source, He is the Giver and Sustainer of life. God declared that He always speaks in righteousness and utters only those things that are right, things which may be found in His Word, and that unrighteousness and things that are wrong are reserved to be spoken in secret and in the dark places of the earth. The idea is that God’s revelation is for all men, not a privileged few who pass it on in secret to other special ones in the dark places of earth. He does not give His revelation secretly and privately as the heathen who give their oracles in secret, darkness, and sometimes in deep caves of the earth, encompassed with mystery, mumbled in low sounds, and designed in obscurity to deceive. In my church, the adult class I attend is currently studying some secret societies that are anything but open in their practices. So when I read this passage this morning, I was impressed again with the rightness and righteousness of God, and the truth of His Word. It started raining yesterday afternoon. The good, gentle soaking kind that doesn’t just beat down the flowers, but that soaks into the ground and gives new life to the poor posies that can never get a good enough drink from a hose. I don’t know how long it’s supposed to last, but right now I’m enjoying the sound of water against the sidewalk, washing the leaves clean of dust from the roadwork being done on our street. I’m enjoying the fresh smell of rain on the dry and thirsty ground. I like the swish of cars passing by, and I like falling to sleep with the sound of rain on the roof. It rained yesterday, a it’s still drippy today. I love it. The rain was desperately needed, washing the air and the trees clean of all the dust from the construction work on our road. It wasn’t a hard rain, flattening flowers or accompanied by strong wind. It was a slow, gentle rain. You could practically see the flowers rise up from their droopy posture and open their petals, having their faces washed and their roots renewed. Of course some people complained. Why does it have to rain on the weekend? Why not during the work week? I’m just thankful for the showers of blessing God poured down on us. We needed it. Refreshing, restorative, life-giving rain. These promises speak of the Millennial Kingdom when Jesus reigns over the whole earth from Jerusalem. Verse 14: Sabeans and Ethiopians were men of extra height. Herodotus says that they were the tallest among men. Solinus affirms that they could be up to 12 feet tall! The conversion of Egyptians, Ethiopians, and other nations is foretold in many scriptures (Is. 2:2-4; 19:19-22; 66’19-21; Ps. 67:4; 68:31; 72:10; Zech. 3:10; 8:23; 14:16-21). During the Millenium, all mankind will confess that there is no other God but Israel’s God. Verse 15: He is a God that hides many of His plans from man, though He is the Savior. Verse 16: Again, idol worship is condemned; makers of idols and those who worship them will experience shame and confusion. 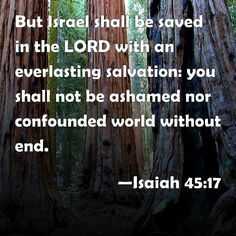 Verse 17: Israel’s salvation will come just as every other person’s comes: through the Lord Jesus Christ. It will be an eternal salvation. Israel’s history of turning aside to idols will be ended. They will never again experience shame, nor will they be struck dumb with fear and confusion because of God’s judgment, for all eternity. Cyrus would not demand ransom; Israel would be free to return, with no money changing hands. This prophecy was made 150 years before the birth of Cyrus, and has been fulfilled in every detail. God is often referred to in Isaiah as The Holy One of Israel. This is an important title, and indicates One Who can do no wrong; One Who is beyond our understanding in holiness and righteousness; and One Who cannot be questioned in a presumptuous manner. He is the One Who knows of things to come concerning His sons (Israel); He created Israel, and He knows their future. God is not boasting in verse 12. 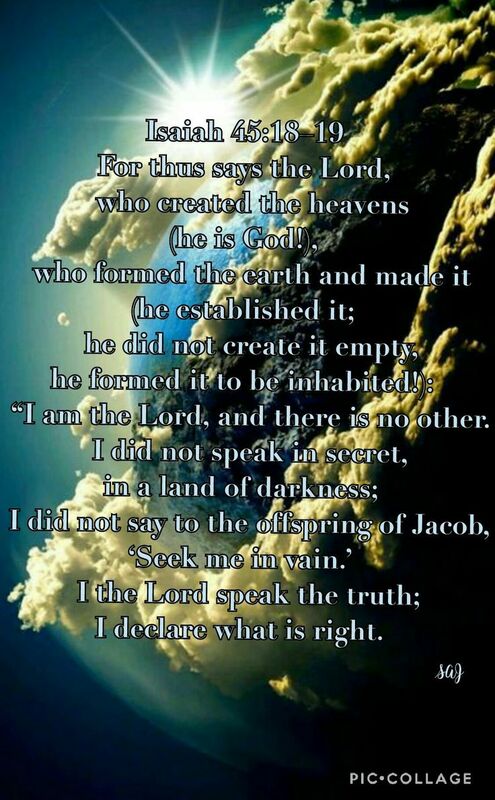 He is simply stating the truth, and impressing upon all mankind that He alone is God, and there is no other. God says that there will be trouble for the person who rebels against God, or refuses to honor his parents. A potsherd is a piece of the original pot, broken off and therefore having no use. Broken pots were tossed into the garbage dump. 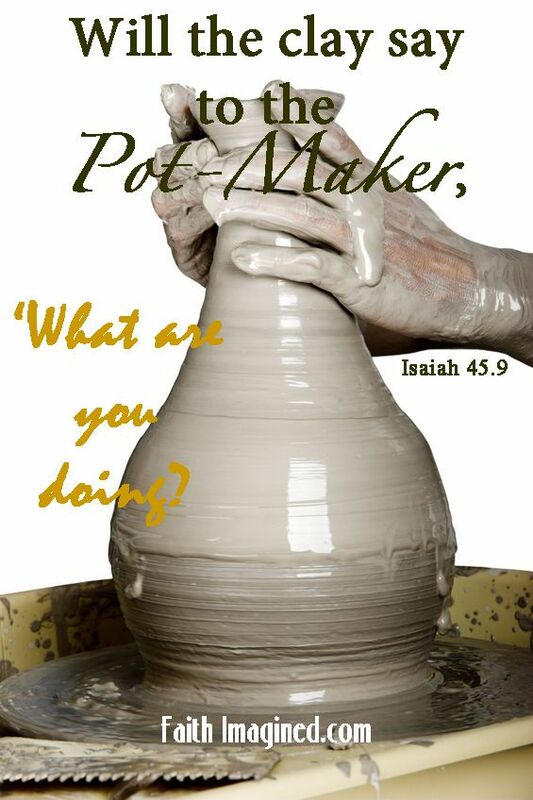 It would have been silly and useless for a sherd to complain to the potter, “Why have you made me like this?” If a potsherd is going to fight with someone, let it be with his equals and not his superiors. No one is superior to God. In the earthly chain of authority, we are to defer to our parents. To do otherwise brings chaos. The phrase he hath no hands is another way to say he doesn’t have the power in his hands to create anything good. That God makes such an emphasis in this passage on the importance of honoring Him, and on honoring our parents, clearly points to the importance of respecting the authorities in our lives.